Factory design, layout and installation often take more time than should be necessary. The more time it takes to bring a factory online, the more it can impact the bottom line, due to delays in revenue generation or missed market opportunities. Today, factory layout processes are prone to error. Because design teams have a difficult time verifying and documenting the existing environment. The impact of equipment placement on the factory floor, within an untrusted 2D layout can create misunderstandings and be costly not just because of the numerous iterations involved but because, if not caught early enough, they will have an even costlier impact during setup and installation. Of all the perceived stumbling blocks in creating a digital mockup of your factory floor, the creation of assets seems to come up, more often than not. So what are assets? And how can we create our own? Assets can be defined as equipment or processes used to manufacture your product on the factory floor. CNC Machines, conveyors, Fork lift truck are all examples of assets. 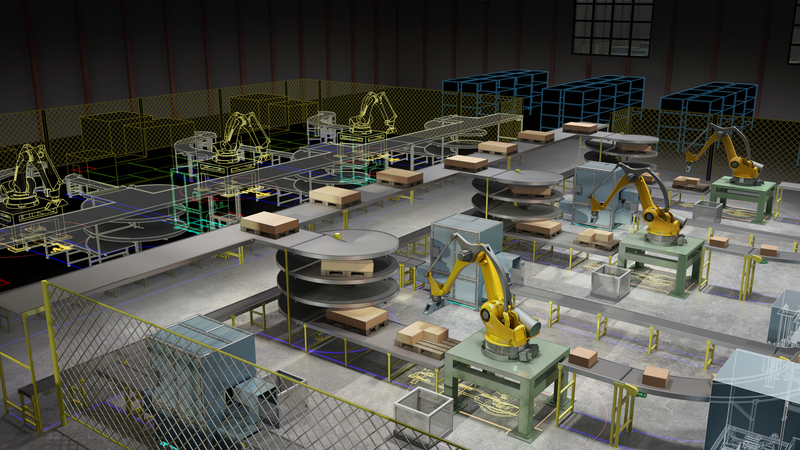 The assets that come with the Factory Design Suite are, for the most part, generic. This is actually by design. If Autodesk went into the asset creation business, they’d have a never ending task on their hands. The idea is – By leveraging the standard Assets from the library, we can modify them to suit our needs. Instead of having to draw lines, arcs, and circles, these utilities allow you to work with lightweight objects that represent the assets used in your Factory. From floor and overhead conveyors, mezzanines and cranes to material handling containers and operators. With these objects, you can “snap” together a layout model without wasting time drawing the equipment. Using the Factory Utilities, you will gain critical insight into your factory layout and installation processes. These types of assets are geared more for the Factory Owners. 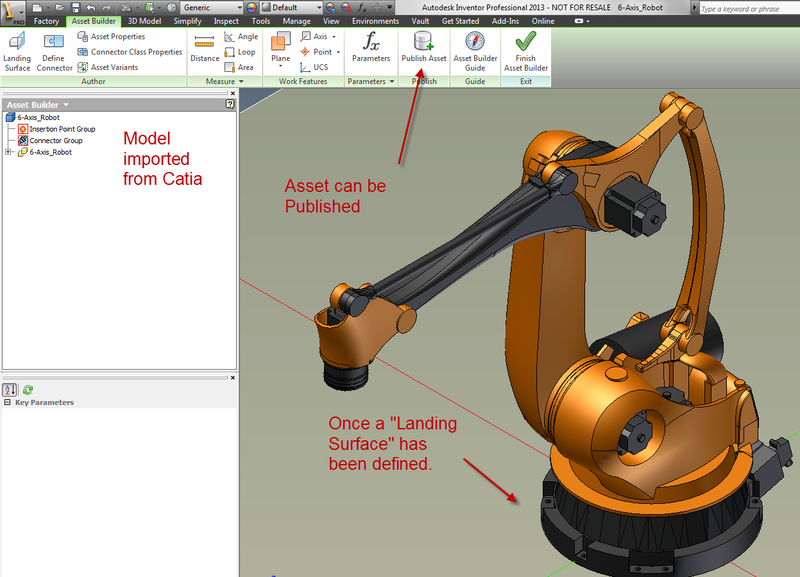 For machine and equipment builders currently using 3D to design their equipment, the creation of assets is almost done. 3D models whether they come from Autodesk Inventor or any other 3rd party model can be used to create these assets. Once a model has been imported, selecting a landing surface and defining connection points, if required, will complete the process. Publishing these assets to a library will ensure everyone is working from the same model. Having a complete understanding of the entire factory and its processes is essential to developing factories right the first time. Factory Design Suite can provide this capability. One tool that I have found to be very useful is found on Autodesk Labs. 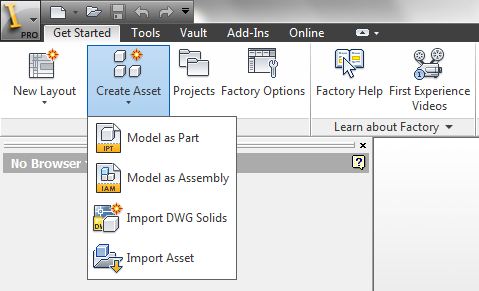 This tool will transform your detailed and complex models, including all its meta-data and provide you with a “smart” and reusable asset for your factory design. The link below will give you an overview of the tool. Inventor Simplification is a free technology preview of a new and easy way to simplify parts and assemblies for downstream consumption and the creation of Factory Assets. Bob has over 20 years experience in the engineering field specializing in machine and Sheet Metal design. His past roles included machine designer using various 2D and 3D Software packages, CAD support and training. Bob has spent the last 7 years as an applications engineer in the CAD/CAM industry. In this role Bob has extensive experience in evaluating the CAD/CAM and work flow requirements of manufacturing companies, and has led to his Autodesk Specialization in Factory Design solutions. Bob also has attained his MCSE certification from Microsoft. web site’s content every dayy along with a cup of coffee.